Mobile devices and apps are everywhere. From native to progressive web apps. We all use mobile apps in our daily life and we all have seen problems while using mobile apps. For example, an app is crashing due to a slow network connection. An app is crashing because of missing data. We all have seen frozen UIs or badly designed mobile apps. To avoid this scenarios and to provide a high quality app to your customers, I offer my help with mobile testing online coaching. The following list outlines possible topics, that I can cover during a coaching session. 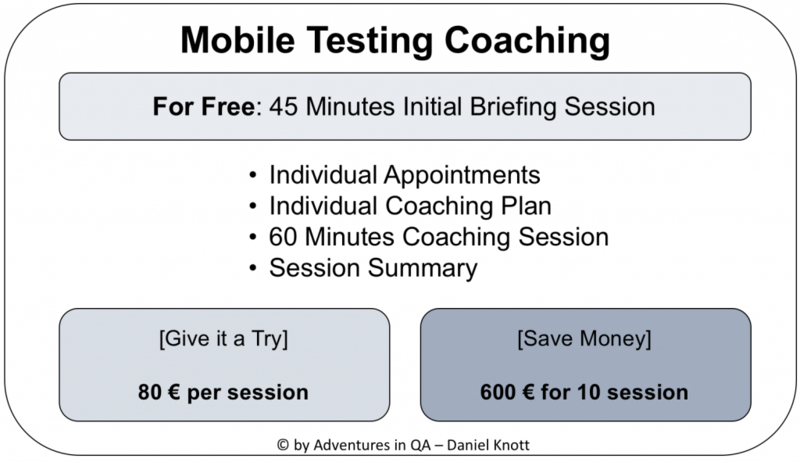 However, each coaching session will focus on your individual mobile testing challenges and needs. Take a minute and read through the list, if you find yourself in one or more points, my mobile testing online coaching is the right way to go. I am new to mobile testing and need an introduction. 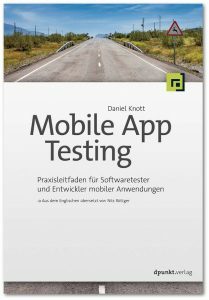 I have no idea where to start with mobile testing. Is there more than a native app? What are the different app types? What are the different mobile platforms and their guidelines? I don’t know the differences between the app stores. I want to establish a mobile test automation process. Where and how to start? I want to integrate mobile test automation within a continuous integration system. But where to start? 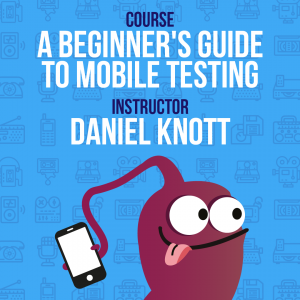 I want to learn the different mobile testing techniques. 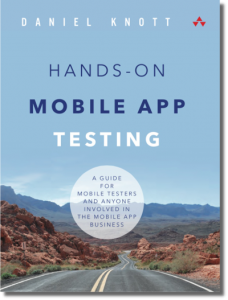 I want to establish a mobile testing process within the SDLC, but where to start? I am not sure about the quality of my app. Can you give me feedback about it? I am not sure about the app store appearance from my app. Can you give me feedback about it? I want to establish a beta testing community with real customers. Where to start? I have no idea how to release a mobile app. What do I need to know and how does it work? I want to get an overview of mobile testing tools for web or native apps and the current market situation. 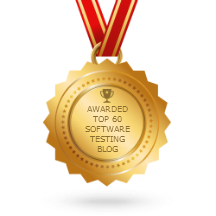 I want to know how to select the right mobile test automation tool. 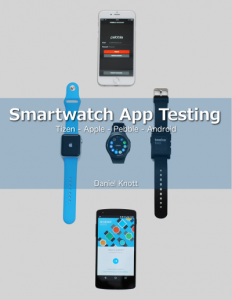 I want to know how to select the right mobile test devices for my app. What are good resources for mobile testing? I get more and more feedback about my app, how do I handle this feedback? After the first initial briefing, I will plan the upcoming sessions based on your challenges and needs. 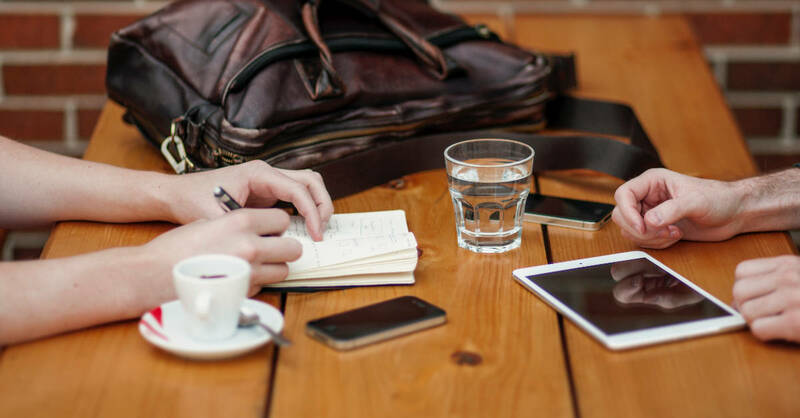 With the help of a briefing template, I will ask specific questions to tailor an individual mobile testing plan for you. After our first talk and some preparation time, we can start with the individual 60 minutes coaching sessions. You decide how often a session will happen, from every week to once a month, everything is possible. After each session I will write a summary report for you to recap and to keep track on the progress of our coaching. For the coaching, we will use an online video chat tool on the market which is able to share a screen and supports video. 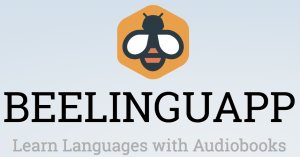 The coaching can happen in English as well as in German. If you don’t know me, Hi I am Daniel Knott. 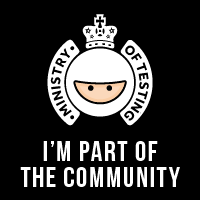 Please take a minute to read the about me section as well as my publications about mobile testing. If you are interested in a coaching session, please don’t hesitate to contact me via daniel [at] adventuresinqa [dot] com. You can also reach me via twitter, XING or LinkedIn.